As an entity of the Department of Homeland Security, the mission of the USFA is to reduce life and economic losses due to fire and related emergencies, through leadership, advocacy, coordination and support. 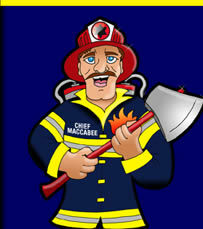 U.S. Fire Administration: For Kids! Short lessons about fire escape planning, smoke alarms and general home fire safety, and much more. Targeted for children under the age of 10. A global network of organizations whose mission is to prevent accidental childhood injury. The U.S. Fire Administration's A Fire Safety Campaign for Babies and Toddlers is a public awareness and education campaign designed to draw attention to the increased risk of fire death for young children, and to teach parents and caregivers how they can avoid the tragedy. FireSafety.gov is a one-stop information resource on the Internet for residential fire safety and prevention information distributed by the Federal government. Enormous family fun! Games, activities, and more! The Home Safety Council is dedicated to helping you create a safer home. Take a virtual home safety tour and learn about leading home dangers, and how to keep your family safe.